Everyone get excited for Beecroft Rugby’s biggest day of the year, the Festival of Rugby! It’s be a great day for the whole family, kids can enjoy some face painting and a jumping castle while the parents get to enjoy some top quality footy, including an Over 35’s Cronies game to celebrate Back to Beecroft. 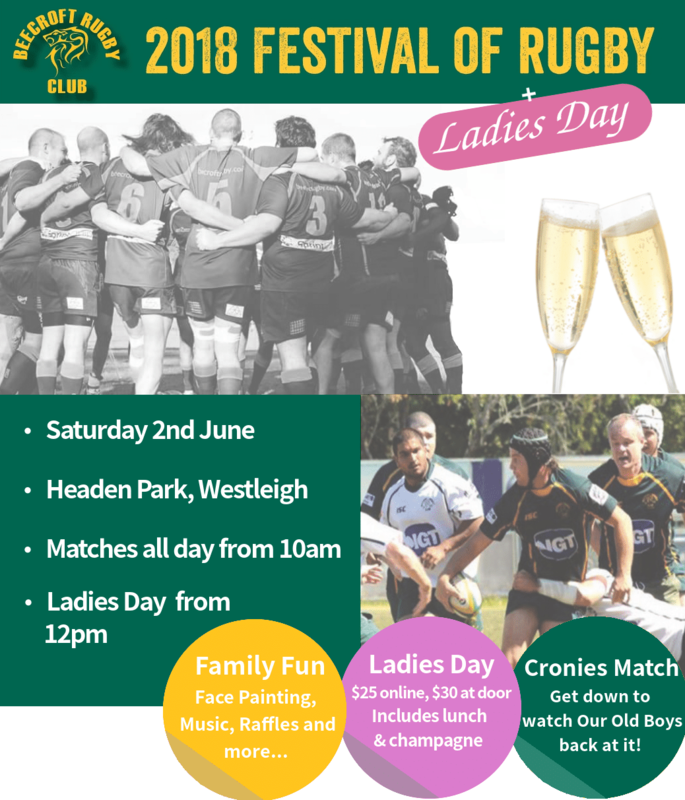 And of course we’ve not forgotten the ladies, so make sure to invite your girlfriend/wife/sister/daughter/mother/grandmother and all their friends, so they can take part in our annual Ladies Day! For $25 these lucky ladies are treated to food, bottomless champagne and prime position in the Ladies marquee to catch all the action. To top it all off we’ll be having a special Ladies Day raffle, with an array of prizes sure to please everyone. So come down and take part in what is sure to be a cracking day.